Logitech R500 Laser Presentation RemoteDeliver impactful presentations with the R500 Laser Presentation Remote. Move freely and navigate slides from up to 65 feet (20 meters) away – and point out precise areas of focus with the red laser pointer. The R500 is optimized to work with Windows®, macOS® and leading presentation software. The R500 is a simple, reliable, and hassle-free presentation remote – so you can focus on crushing your delivery. The R500’s unmistakable three button design means you can navigate your presentation slides with ease and confidence without having to look down to orient your fingers. Point out precise areas of focus in your presentation with an easy-to-use and bright red laser pointer. Customize button functions, monitor battery life, and set an on-screen timer from the Logitech Presentation App. Never worry about your computer going to sleep, the app keeps it awake while you present. Connect your R500 to your computer via USB receiver or Bluetooth® low energy technology. Then move and present freely from as far as 65 ft (20 meters) away. 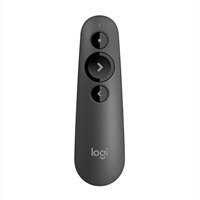 The R500 Laser Presentation Remote has been designed to fit snugly into the palm of your hand, and its soft rubber surface and textured buttons allow for a confident grip while presenting. Deliver impactful presentations with the R500 Laser Presentation Remote. Move freely and navigate slides from up to 65 feet (20 meters) away – and point out precise areas of focus with the red laser pointer. The R500 is optimized to work with Windows®, macOS® and leading presentation software.